« Nuclear weapons are prohibited! Resolution L.41 immediately fences these countries in by making their participation in the 2017 negotiations unwelcome and unlikely. If they do attend, they will have a hard time negatively influencing draft text as the conferences will be held under UN General Assembly rules of procedure which allow for states to vote when consensus cannot be reached. A total of 57 nations co-sponsored the resolution, which was drafted by Austria, Brazil, Ireland, Mexico, Nigeria and South Africa. The path is now clear for these “humanitarians” to draft a strong treaty text that sets the highest possible standard banning nuclear weapons. The humanitarian initiative has the backing of key UN agencies, the International Committee of the Red Cross (ICRC), and the International Campaign to Abolish Nuclear Weapons (ICAN). The campaign believes a treaty outlawing nuclear weapons will help establish a powerful new international legal standard, stigmatize nuclear weapons and compel nations to take urgent action on disarmament. Given the ban outcome that loomed, the US, Russia, UK, and France vigorously opposed the draft resolution in the days and weeks leading up to the vote. 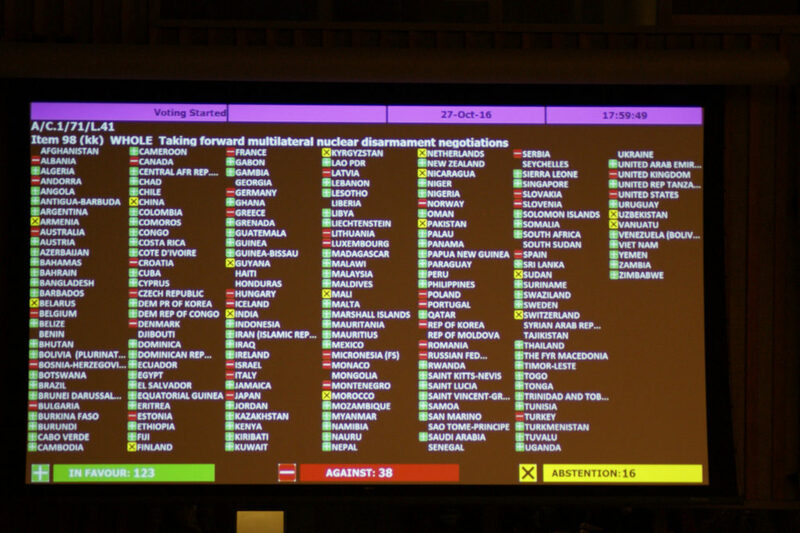 Yet their threats and bullying, warning of dire consequences, and derisive comments on the humanitarian initiative backfired dramatically when three-quarters of the countries voting collectively supported the draft resolution. Two decades ago, Hajnoczi played a central role in another initiative aimed at addressing an indiscriminate weapon, when he helped draft the text of what became the 1997 Mine Ban Treaty prohibiting antipersonnel landmines. The humanitarian process to ban nuclear weapons adheres to many tenets of the well-trodden humanitarian disarmament path carved by the Mine Ban Treaty and followed by instruments curbing the use of child soldiers, affirming disability rights, and creating the International Criminal Court. Not all countries will participate in the negotiations or sign immediately, but the frameworks provided by these treaties give those living in states that have not ratified something to aspire to join in the future and adhere to in the interim. The humanitarian initiative comes 70 years after the first UN General Assembly resolution adopted in 1946 that proposed “the elimination from national armaments of atomic weapons and of all other major weapons adaptable to mass destruction.” Since then chemical weapons, landmines, and cluster munitions have been banned, but not nuclear weapons. The last multilateral nuclear disarmament instrument was negotiated in 1996 to comprehensively ban nuclear tests, but has yet to enter into legal force due to opposition by a handful of nations. As with previous initiatives, victims and survivors actively contribute to the movement, in this case survivors of nuclear weapon detonations such as Hibakusha from Japan’s Hiroshima and Nagasaki and others harmed by nuclear testing. At the center of the humanitarian process to ban nuclear weapons is an informal partnership between like-minded governments, UN officials, Red Cross representatives, and campaigners from the highly-organized global coalition of non-governmental organizations. The resolution clearly states that the 2017 meetings will be open to “participation and contribution of international organizations and civil society representatives.” ICAN was founded in April 2007 by the Australian branch of the International Physicians for the Prevention of Nuclear War (IPPNW), recipient of the 1985 Nobel Peace Prize for its authoritative work “to create awareness about the catastrophic consequences of atomic warfare.” ICAN’s core goal has been to call for the immediate start of negotiations to create a treaty prohibiting nuclear weapons. Today ICAN’s tiny global coordination team is functioning on perilously low funds, but the campaign is enriched and bolstered by its broad and committed membership uniting humanitarian, human rights, and other non-governmental organizations together with peace and disarmament groups, including many that have fought to abolish nuclear weapons over the past seven decades. ICAN’s executive director Beatrice Fihn previously worked for ICAN Steering Committee member Women’s International League for Peace and Freedom (WILPF), which last year commemorated its 100 year anniversary. Other campaign leaders include Peace Boat, a Japanese NGO-registered passenger ship that has traveled around the world taking Hibakusha and youth to speak about the unbearable human suffering brought by the two atomic bombs and seek support for the ban. It appears that their quest may finally be within reach. The humanitarian process is bound for success, but will ultimately be measured by the strength of the treaty’s core provisions rather than by who signs it first.